Higbee shows off her collection of fabric. NORTH LOGAN – Today through Monday, Annette Higbee of North Logan will have her Anna Bouche handmade dresses featured on <a href=”http://www.zulily.com/” target=”_blank”>Zulily.com</a>. You must be a member to shop on Zulily.com but creating an account is free. The website provides daily deals for moms, babies and kids. “I don’t know how Zulily found me, but they contacted me and asked if I could do 2,000 dresses for them,” said Higbee. At first, Higbee felt overwhelmed but with the help of her family and friends, she took on the challenge. Her son rented a van and they drove to Los Angeles to buy fabric. Then Higbee found eight other capable seamstresses to help her produce the quantity needed. Several of her seamstresses live in Utah Valley and another woman lives in Newton. “It’s been a really fun thing to see what these women can do. A lot of them have really stepped up to the plate,” she said. With the help of technology, Higbee is able to share tutorial videos online with the other seamstresses. This way, everyone makes the dresses the same way. Since she has been sewing for years, Higbee is able to create products quickly. She said she can show a seamstress how to make 10 different dresses in five hours. So far, Anna Bouche sales on Zulily have been doing well. “Right now, we’re selling a dress about every 10 to 12 minutes,” said Higbee. Higbee started designing children’s clothing in 1986 for HLRockinghorse in Boston. She said working for this company really gave her an opportunity to learn new things. HLRockinghorse went out of business in 1993, so she worked other jobs while continuing her designing and sewing on the side. Then in 2005, Higbee was in a rollover accident while traveling to Salt Lake City with three of her children. At that point, Higbee started on the long road to recovery. Then after struggling to find a job, she decided to make one for herself. That’s when she made Anna Bouche a full-time business. She revamped her website, started an Etsy shop, and sold products on Amazon and EBay. Higbee said working on her business from home and creating something she loves is much more fun than sitting on the couch and thinking about how much her feet hurt. Higbee’s dresses will be for sale on Zulily.com until December 9th at 7 am. You can also shop for her dresses on her website at <a href=”http://www.annabouche.com/” target=”_blank”>annabouche.com</a>. Her handmade dresses are all under $100 and she also makes Christening gowns. 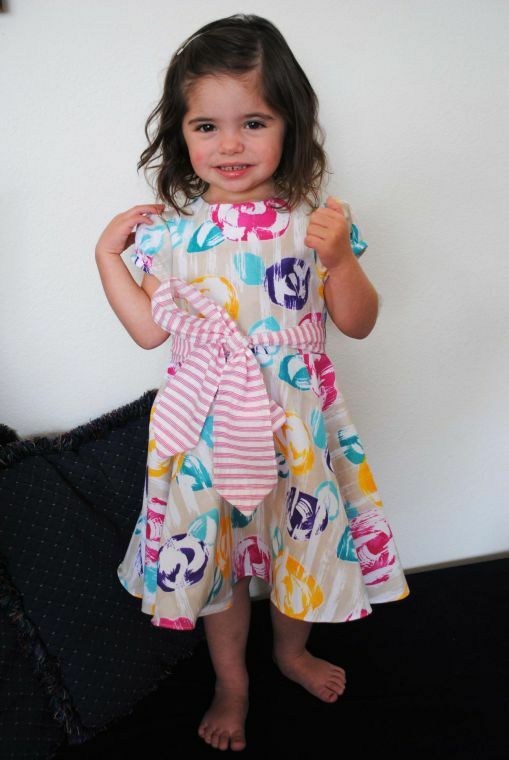 Higbee's granddaughter wearing the cotton swirl print dress.